Posted: July 6, 2008 12:22 a.m. 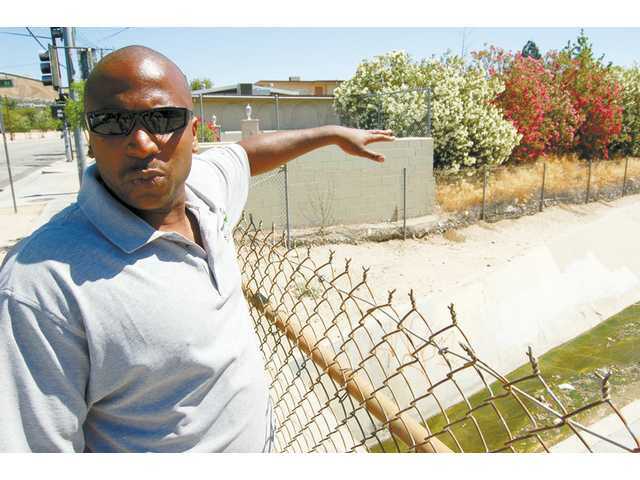 Updated: September 6, 2008 5:02 a.m.
Julian Woodard, an employee with the city’s graffiti removal team, points out graffiti in a wash that runs along Whites Canyon Road. Ryan Faretta uses Bare Brick solution to loosen graffiti from a street in Canyon Country in May. Ryan Faretta, who works for the city’s graffiti removal team, uses a pressure washer to remove tags from a wall on Whites Canyon Road in Canyon Country last May. Less than 15 minutes was needed to remove the grafitti. It’s 9 o’clock in the morning and it’s already a blistering 90 degrees out, but Ryan Faretta and Julian Woodard are hard at work out on the streets of Canyon Country. Sweating it out under the blazing sun with their pressure washers and vacuums, they don’t miss a single spot as they expertly scrape, wipe and flush away all signs of graffiti from a wall, a sidewalk and a palm tree trunk along Whites Canyon Road. As Faretta finishes eradicating the last few remnants of paint, Woodard heads to his vehicle to start inputting the details of the job into his on-board computer, which tracks the place, time and cost of the job. Within 15 minutes, this two-man hit squad is done and ready to go. They jump into their truck, emblazoned with the words “City of Santa Clarita Graffiti Removal Program,” and move on to their next destination, just few hundred yards down the road. Faretta and Woodard are two of the six part-time city employees whose job is to clean graffiti from the walls and washes of Santa Clarita — and they are doing a pretty good job of it, according to city officials. 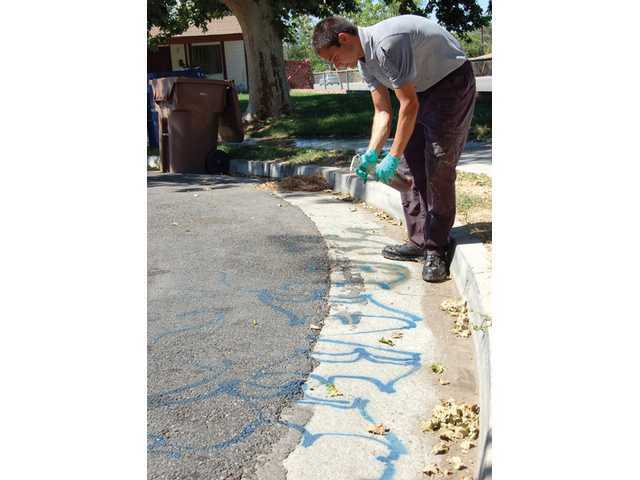 “We get a lot of positive feedback on how quickly graffiti comes down and how efficient the crews are at coming down to areas that get tagged on weekly or even daily basis,” said Nico Marinelli, graffiti removal coordinator for the City of Santa Clarita. That efficiency is a result of the efforts of a fleet of dedicated city employees, an army of volunteers, plus a healthy dose of funds and state-of-the-art equipment. All removal requests start in Kristine Saunders’ office. When a member of the public notices graffiti in his or her neighborhood and calls the graffiti hotline or sends a request through the city’s Web site, the message goes directly to Saunders’ desk. She inputs the relevant data into the graffiti tracking database, then assigns it to a cleanup crew. Cleanup requests are usually divided into three geographical areas, with one cleanup crew assigned to each area. Once they get the assignment, the crew heads out with a truck, pressure washer and an array of other cleaning materials. When they get to their destination they first take photographs of the “tag” (or tags), then set out to eradicate them. Tags on walls and sidewalks are first sprayed with a solution called Bare Brick, which helps loosen the paint. Then they fire up the pressure washer to force the remaining pigment off the surface. If the tag is found in a wash or other area that is inaccessible to equipment, they paint over it instead of removing it. Once they finish, the guys log all the vital details of the job into their on-board computer, which syncs up with the database back in Saunders’ office. They document the amount of time the job took, the method of removal, what the tag says, how it was applied (i.e. with spray paint or marker), and if the marks were made by a tagging crew or a “one-er” (individual). The computer automatically calculates the cost of the cleanup, using a base charge of $357.80 per incident, based on what the cleanup would cost if all the equipment was rented by the hour. This level of documentation is an invaluable tool to help the Sheriff’s department with their graffiti-busting efforts. It allows them to track not only who is tagging and where, but if an individual is caught and convicted, the database can calculate how much restitution he or she owes. Marinelli said that the graffiti program gets anywhere from 1000 to 1300 removal requests a month. Some of the calls pertain to the same piece of graffiti, so the actual number of tags is probably somewhat less than that, but it is a large number nevertheless. To keep up with demand, the cleanup crews work five days a week, eight hours a day, plus one Saturday a month. They can usually handle about 20-25 removal requests a day. To augment the efforts of the paid crews, dozens of volunteers from around Santa Clarita regularly turn out to assist them. TAG (Teens Against Graffiti) crews several dozen strong head out the third Saturday of every month to do their part. Hundreds of others culled from church groups, Scout clubs, and local elementary and high schools also help out on an ongoing basis. “A lot of people need to get volunteer hours for school or scout projects and we mention graffiti removal to them when they call us,” said Hope Horner, community services administrator for the City of Santa Clarita. In fact, graffiti abatement used to be an all-volunteer effort until last summer. Graffiti removal in Santa Clarita was started in 1991 by the P.R.I.D.E. 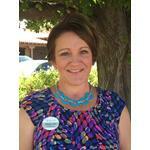 committee — a partnership of community members and city staff working on a volunteer basis. The city supported them with resources such as paint and a truck. But as the city grew, so did graffiti. Graffiti, most of which is gang-related, is currently one of the most common and destructive crimes to plague the Santa Clarita Valley, according the Sheriff’s department. Funds were allocated to the program, which allowed the city to purchase the trucks, hire employees and create a database. In fiscal year 2007-2008 a half million dollars was spent on personnel, rewards and equipment. Another part of the formalization process was the creation of the Graffiti Task Force, which brings together the city, the county, the Sheriff’s department, and various public and private entities such as Time Warner and Southern California Edison, whose equipment is frequently targeted by taggers. These organizations are unified in their dedication not only to the expeditious removal of graffiti, but to the capture and conviction of taggers, as well as prevention and education programs. The city provides a monetary reward of up to $500 to community members who provide information that leads to the arrest and conviction of taggers. It also sends representatives to local schools to do outreach presentations about how graffiti affects the community. The efforts have paid off, according to Horner. And the residents of Santa Clarita seem to be overwhelmingly appreciative, according to Woodard and Faretta. Their work can be grueling at times, but the kudos they get makes it rewarding as well.